[SPOILERS] Boy it's been a while since I dusted off the old Moments In Cool series, but if I'm going to hop back on the bike, best I do it with two of my favourite forces in comicdom - Psylocke and Archangel. 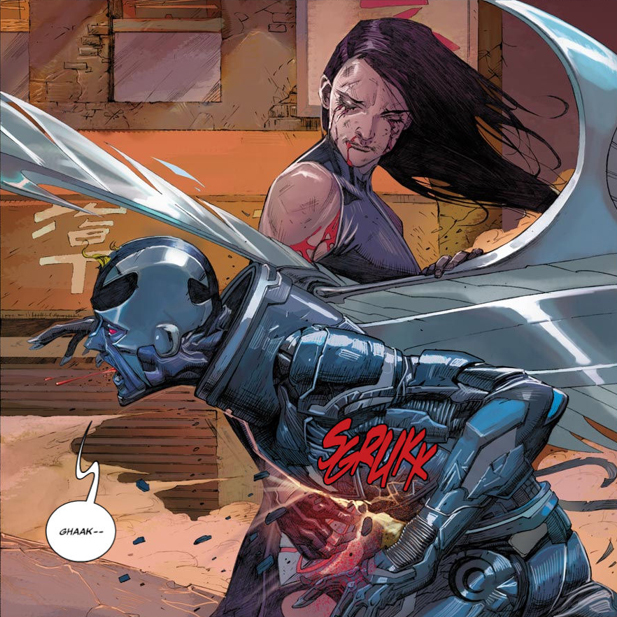 Uncanny X-Force #18 is the issue in question, where the Archangel persona has taken hold of Warren Worthington III's mind, forcing his team-mates to travel to The Age Of Apocalypse to retrieve the one weapon that can prevent him from annihilating all life on Earth. The one to actually blindside the deranged original X-Man and use it? Now in the hands of an average writer, that's where the stunning Dark Angel Saga story-arc would've ended. But this is writer Rick Remender, and if there's greatness hidden in a scene other's might miss, like the telepathic ninja he too often seems to be, Rick will hunt it out. Drawn in stunning detail, both in backgrounds and body language by Jerome Opena, Psylocke kneels beside her beloved Warren, who is now back in control of his body. Attempting to soothe his fears over his fatal injuries, she places her fingers atop his forehead, whispering "I'm not going to let you die.... Just listen to my voice... Close your eyes. When you wake up..." and then the following pages. While like the ending of Inception, that last panel doesn't quite reveal whether it is fact or fiction, the very next page does. In fact even though the issue has just four more pages after these, the creative team stab readers through the heart with their own psi-blade in equally stunning ways, another two times before the issue is through. 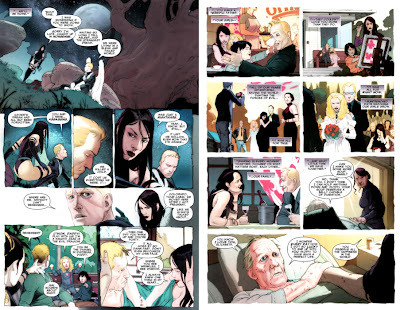 That my friends is why Uncanny X-Force will go down in X-history as a champion run. For more great Moments In Cool, click the jump! Just wow. That was truly beautiful. If I was a lesser man I'd be crying like a little school girl, but that was genuinely beautiful and moving. Thanks for sharing that scene. I hope, even though its in the very nature of comics to not happen, that that particular future does happen. I know right Dale :-) After reading that scene you feel like goin and kickin a ball round or fixing a car huh? Or at the least saying 'Wolverine rocks' in a really gruff voice. I would but my eyes are tearin up like the time I got my own Optimus Prime. That Rick fella is a wicked wicked man and writer to be able to do that. Looking forward to his Captain America! Yeah, okay. Thanks Dan. Now I have to go grab some chocolate and the whiskey bottle. Thank goodness I'm a chick and therefore am expected to cry over this stuff. Cause I'd hate to have to swallow it back down. Again. At least this time the issue's not sitting in front of me and I have to be careful not to get stuff on it. 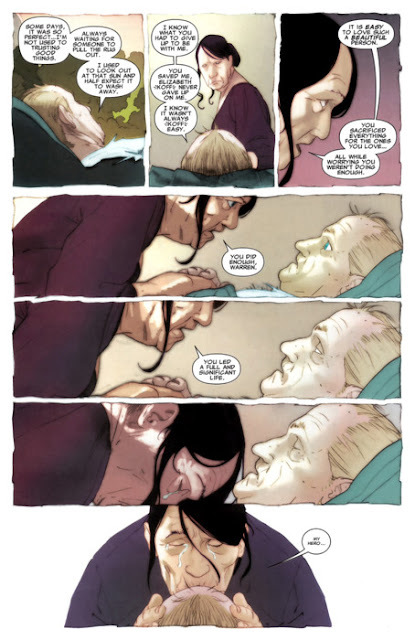 In the world of the X-Books (where you actually expect everyone to get the shaft in the happy ending department, even more than in any other comic series) this one just wrenched. And you couldn't tell if were wistful, sad, or just flat out hormonal at the end of it. One of the best writing jobs I'd seen on those wacky X books in a while. Jack 'King' Kirby wouldve been 95 today. Happy Birthday Mr. Kirby, a true icon. Chocolate and whiskey lol - nice one Random! Hey - when isn't a good time for chocolate. I ask you. I'm sure even 90's Image Comics females still fitted the odd Snickers into their 1cm waist diets from time to time! You are bang on though.. This series and issue was the best moment of it's kind since Blue Beetle bit the dust at the hands of Maxwell Lord. Poor Ted. I just wasn't ready for that relationship to end. Karl - wow mate thanks for pointing that out I'd completely forgot. KIRBY: King of Comics is a book that takes pride of place on my bookshelf, and while I didn't get his art as a wee tike, I freakin' go ape over it now. A living legend long after he continued to be so, and one that every fan be they a fan of his or not owes him a debt of gratitude, because we truly wouldn't have a comics industry without him. Raise your glasses, everyone. To Jack "King" Kirby. Long may he live in our hearts, minds, and the comic books that grace our collections. Chocolate and whiskyis a good mix! I didn't know about Jack Kirby.